Can copyright the expression of ideas, facts, etc. (b) make a single reproduction for backup purposes of the copy or of a reproduced copy referred to in paragraph (a) if the person proves that the reproduction for backup purposes is destroyed immediately when the person ceases to be the owner of the copy of the computer program. 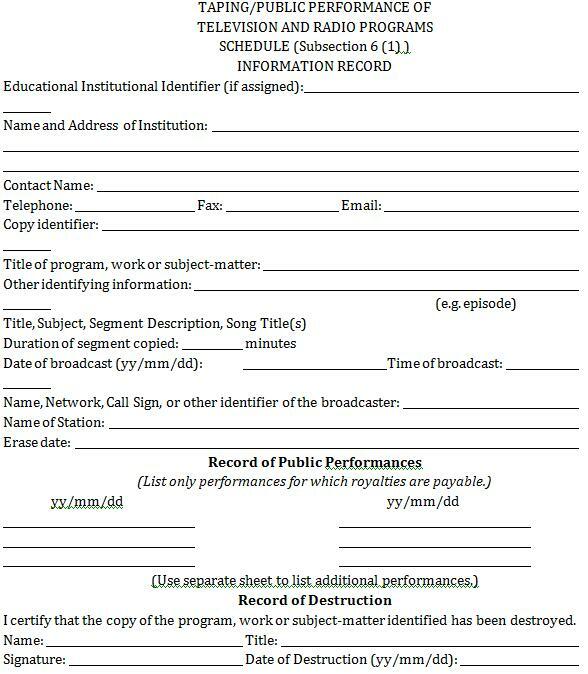 No royalty is payable for taping a single copy of a news program or news commentary program provided that that copy is destroyed within one year after the making of such copy. This royalty exception does not apply to “other” programs, such as documentaries and feature films. To determine whether a royalty is payable, educators may refer to the following guidelines, which are intended to assist in distinguishing between the three categories of program. The initial guidelines were developed in cooperation with the ERCC and representatives of elementary, secondary, and postsecondary educational institutions. This list has been updated by Manitoba Education, Citizenship, and Youth to reflect the current situation. A news program is a program reporting on local, regional, national, and international events as they happen, and includes weather reports, sportscasts, community news, and other related features or segments contained within the news program. Examples are The National (the first half-hour only), Ontario Ce Soir, BBC World Report, Le Téléjournal. A news commentary program is a program containing discussions, explanations, analysis, observations or interpretations of the news and having a preponderance of the following elements: “talking head(s)”; minimal editing; minimal “shelf life” in its original form; and, if in interview or panel discussion format, unscripted responses. Examples are As It Happens, Studio 2, The Editors, Larry King Live, Le Point. Other programs are programs that are not news or news commentary programming. Feature films and documentaries are examples of other programs. A documentary is a socially relevant program with a creative vision and/or viewpoint and with a preponderance of the following elements: significant research and preparation; pre-scripting; significant editing; and significant “shelf life.” Examples are: Life & Times, Venture, Marketplace, The Nature of Things, Rex Murphy, Les affaires et la vie, D’un soleil a l’autre. (e) an entire chapter which is twenty percent (20%) or less of a book. (c) a reasonable number of Copies for reference in or loan by Libraries. 5.11 Notice on Copies: The Licensees shall notify their respective employees and agents that, in accordance with good bibliographic practice, Copies of Published Works shall include, on at least one page, a credit to the author, artist or illustrator, and to the source. (c) communicate to the public by telecommunication to or from a place where a person is participating in a program of learning under the authority of an educational institution. 2. Why does education need an exemption? Wanda Noel. (1999). Copyright Guide for Canadian Libraries. Ottawa: Canadian Library Association, $44.95, ISBN: 0-88802-294-8. Lesley Ellen Harris. (2001). Canadian Copyright Law 3rd Edition, Toronto: McGraw-Hill. ISBN: 007-560-369-1. Lesley Ellen Harris. (1998). Digital Property: Currency of the 21st Century. Toronto: McGraw-Hill Ryerson. ISBN: 0-07-552864-0.